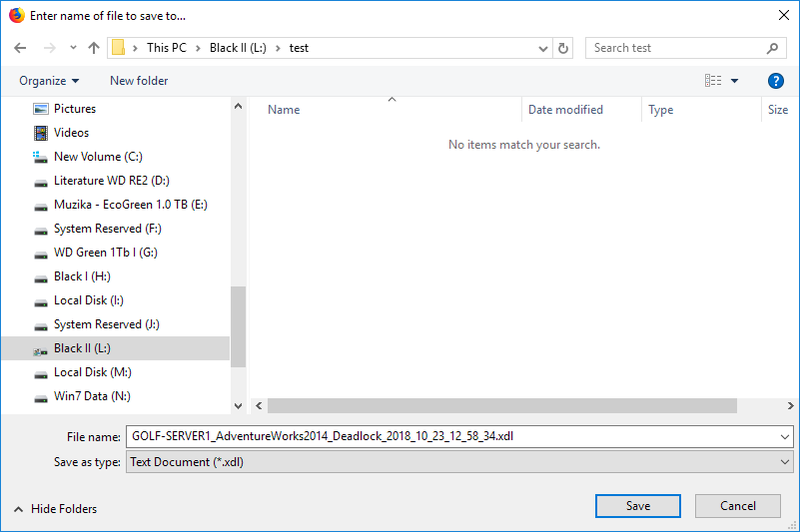 This article provides information on how ApexSQL Monitor can be used for investigation of SQL Server deadlocks, as well as how and what diagnostic data it collects to diagnose and troubleshoot occurred deadlocks. How does ApexSQL Monitor collects SQL Server deadlocks data? What is the difference between the ApexSQLMonitorDeadlock extended event and system_health extended event? What permissions are needed for using extended events? Does the application use the SQL Server Trace to collect the deadlocks data? What is the overhead that ApexSQlMonitorDeadlock extended event can cause on the monitored SQL Server? Can I see the script of the ApexSQlMonitorDeadlock? How can I set the deadlock monitoring and deadlock event alerts? Will ApexSQL Monitor configure ApexSQLMonitorDeadlock extended events automatically when deadlock monitoring is enabled? Where can I see the details of collected deadlocks? Can I see a collected deadlocks graph? What are the Deadlocks metric and does it behaves as any regular SQL Server metric? Will ApexSQlMonitorDeadlock extended events remain on the monitored instances when I uninstall the application? How can I start or stop ApexSQlMonitorDeadlock extended event manually if needed? This is a customized extended event dedicated to deadlocks collection. 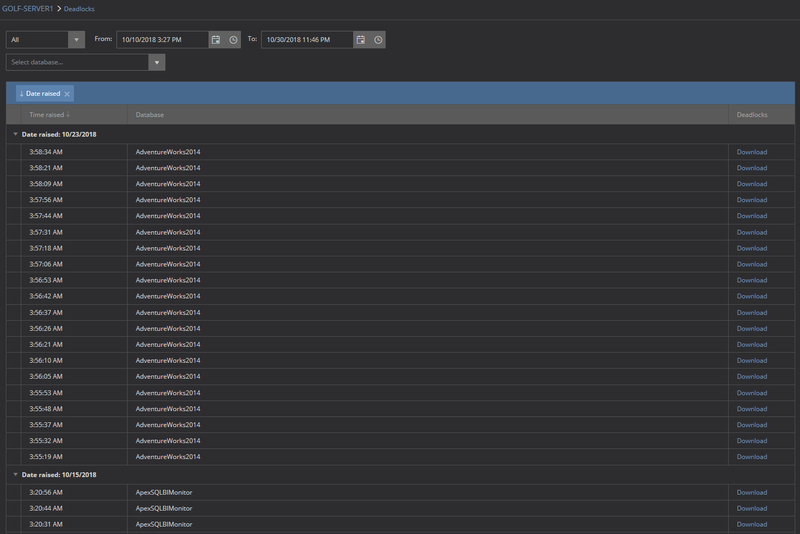 When enabled, ApexSQL Monitor will create ApexSQLDeadlock extended event on the monitored SQL Server. As being a dedicated extended event explicitly designed for deadlocks monitoring, it doesn’t have any limitations that affect the system_health extended event. Therefore, when enabled, it allows capturing of all deadlocks with minimal delay, and it is not affected by the server activity level. For SQL Server 2008 and 2008R2 – the CONTROL SERVER permission must be granted. For SQL Server 2012 and newer – the ALTER ANY EVENT SESSION permission must be granted. What is the overhead that ApexSQLDeadlock extended event can cause on the monitored SQL Server? Can I see the script of the ApexSQLMonitorDeadlock extended event? 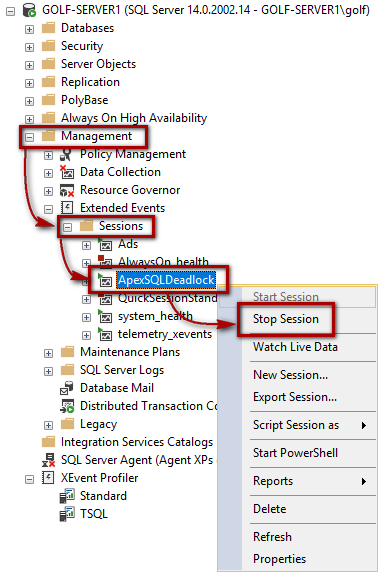 ApexSQL Monitor deadlock monitoring and alerting are enabled by default using the system_health extended event. Yes. The application collects and stores the deadlock information in the repository database as XDL files. The XDL file for each deadlock can be downloaded using the Download link for the desired deadlock in the Deadlocks column where deadlocks are listed. What is the Deadlocks metric and does it behaves as any regular SQL Server metric? How can I stop and start ApexSQLMonitorDeadlock extended event manually if needed?